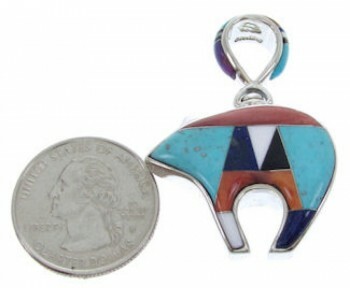 Sterling silver, Turquoise, Magenta Turquoise, Lapis, Opal, Black Jade, White Inlay, Red and Orange Oyster Shell. You will absolutely fall in love with this stunning reversible pendant! 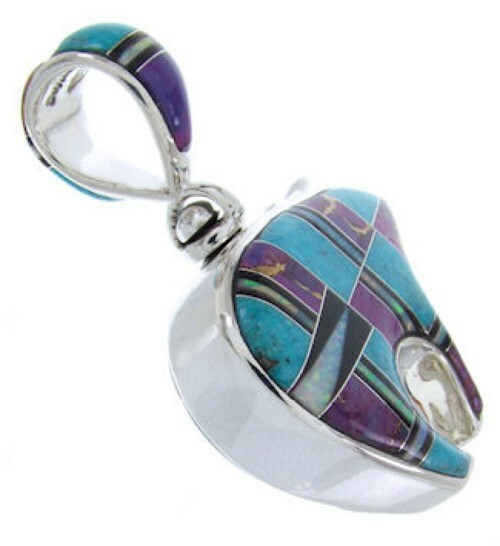 The pendant is a gorgeous piece of jewelry that is hand crafted out of genuine sterling silver and Multicolor Inlay. Real Turquoise, Magenta Turquoise, Lapis, Black Jade, White Inlay, Red and Orange Oyster Shell, along with man made Opal are carefully set, while forming a lovely bear design. The pendant is reversible it can be worn on either side. (Its like having two pendants in one!) Both sides of the bear are highlighted with Multicolor inlay. In some beliefs the bear symbolizes physical strength, leadership and is known as the "first helper". The pendant is stamped sterling and hallmarked.